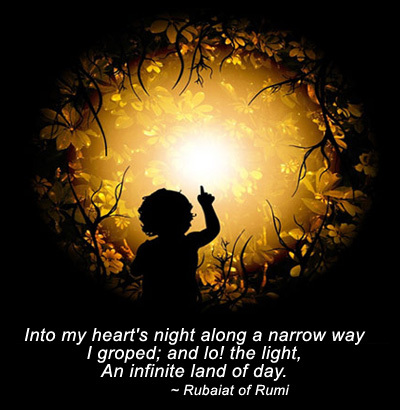 In this monthly INNER JOURNEY gathering you "Become The Tracker" in your own life, learning how to read spiritual messages that are all around you, tap into the power of animal guides and archetypes, learn about Sacred Ceremony, Prayer, Meditation and Intention, Music, Energy Work, Creativity and what is required to bring your consciousness into wholeness, through the map of the Universal Medicine Wheel. Addiction Alchemy and the Universal Recovery Medicine Wheel doesn't directly approach addictions per se, but rather acknowledges the process of addiction within all of our lives, focusing on the remembrance of all the parts of the self to restore wholeness. 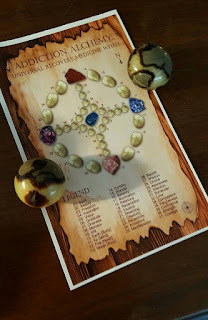 On some level we all have addictions, attachments, belief systems, patterns and imprints, as well as ancient, ancestral or karmic ties. We believe that all recovery is a recovery of the True Self... and it is from this place that true healing and growth occur. Soul Recovery is Soul Retrieval. 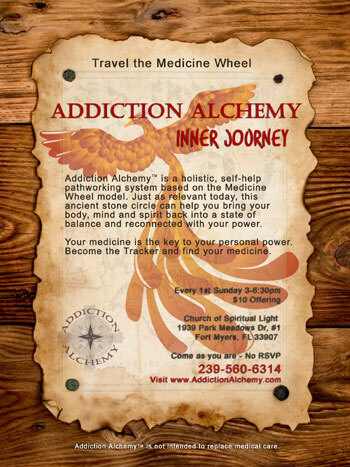 On the 3rd Sunday of every month we are also now offering Addiction Alchemy Field Guide training. You can lead your own Addiction Alchemy: Inner Journey gatherings. Help us bring this powerful tool to people everywhere, as a grassroots movement to help people go Beyond Sobriety and Beyond Anonymity. Click here to learn more about the Training.